It is happy to note that this is a new initiative of voluntary dissemination of the information and displaying of records from Sub Collector Office, Gudur Sub Division. Ensuring transparency, accountability and participatory decision making are the prime objectives of having this open source web page launched here. Gudur Sub Division, the Southern most coastal Division of Andhra Pradesh belongs to SPSR Nellore District in the Southern Andhra Coastal Plain. It spreads over sixteen Mandals and six hundred and ten revenue villages. It is bounded on the East by Bay of Bengal, South by Chittoor District and the Thiruvallur District of Tamil Nadu state and on the West and North by Nellore Division. We make information and records which involves life of the public easily accessible in order to honour the rights of the inhabitants of our Sub division area that enshrined in Constitution of India and many other legislation especially Right to Information Act, 2005. Facts and figures on number of grievances petitions and files received and its disposal disclose their status at a given point of time. Our e-Governance initiatives would tell the people as to how to proceed further to make interface between governmental organisations and citizens more and more effective. Posting work schedules, reports, government orders, proceedings, circulars, guidelines, programmes implementation, important events, and so on except few legally restricted and confidential information would reveal the people how Sub Collector Office, Gudur is administered. Uploading information on land and revenue administration, maintenance of law and order, enforcing and regulating varied establishments as per different laws, civil supplies matters, developmental issues, divisional disaster management action plan and so on in these pages would give the residents a chance to get to know the issues concerning Gudur Sub division. With great respect to the people of Gudur Sub division, we sincerely encourage everyone to make comment upon the information given or express their opinions, propose suggestions or put forward the ideas which would ensure the participation of the people in decision making process. We extend warm welcome to all, especially the citizens in Gudur Sub division jurisdiction, to respond on various subjects which in turn may become useful inputs to the decisions taken by us. We expect all the stakeholders to contribute a lot in terms of your comments under each and every post being uploaded in this web page. sir plc upload about gudur information … i have intrest to read it…. Welcome to subcollectorgudur.wordpress.com We are on the job of fulfilling your aspiration. 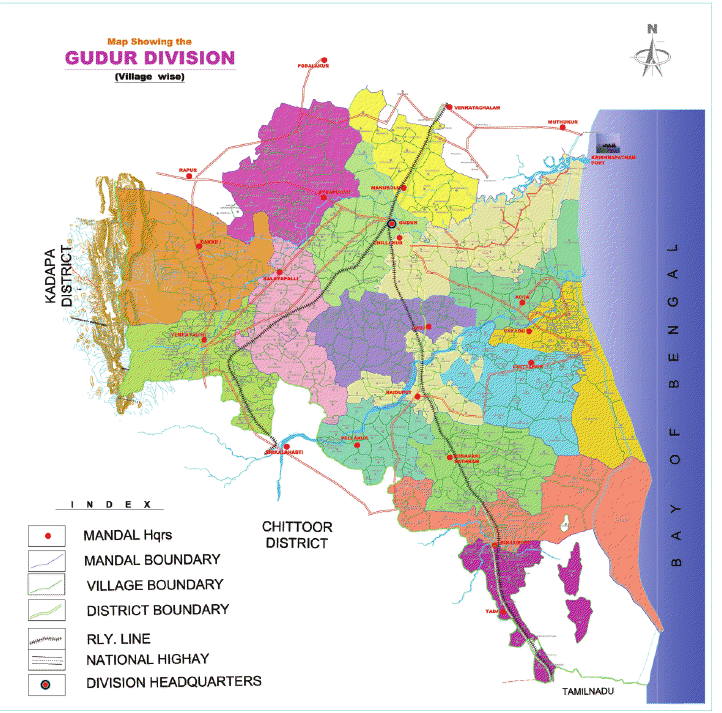 You are also welcome to provide info about GUDUR which will be uploaded based on qulaity of contents. sir i appreciate ur attitude and transperency as a parent and a humanbeing. "Gudur Sub Division, the southern most coastal Division of Andhra Pradesh belongs to SPSR Nellore District in the Southern Andhra Coastal Plain. It spreads over sixteen Mandals and six hundred and ten revenue villages. Dissemination of information and displaying of records from Sub Collector Office, Gudur Sub Division are the humble attempts to ensure transparency, accountability and participatory decision making, the cornerstones of good governance. So, lets everyone, especially the citizens in Gudur Sub division jurisdiction, to take part with great enthusiasm. Make your responses on various subjects as useful inputs to the decisions being taken by us in terms of your comments under each and every post being uploaded in this web page"